In Part One, we learned that even though voters can vote for up to four Council At-Large candidates, they vote for only three on average. Today we examine whether that statistic varies based on geography. 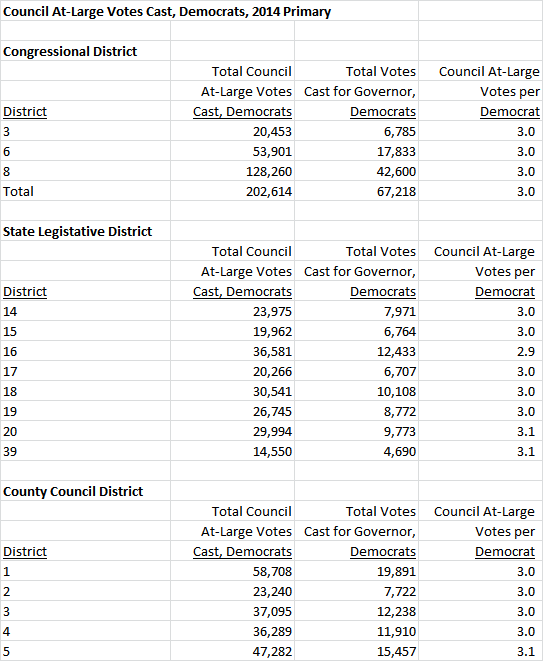 The chart below shows the total number of Council At-Large votes cast in the 2014 Democratic primary, the total number of Democratic votes for Governor and the ratio between the two from precinct votes on Election Day. (Precinct-level turnout numbers from the state include early voters, absentee voters and provisional voters, distorting their use as a denominator, so we used votes for Governor as a proxy for Election Day voters by precinct.) On average, each Democratic voter cast three votes for Council At-Large candidates. That statistic varied very little between Congressional districts, state legislative districts and council districts. Let’s take a deeper dive and look at local areas. Again, there is minimal variation. A mild outlier is Precinct 11-00 in Dickerson, home of at-large challenger Beth Daly. Was there some undervoting there for Daly and her 2014 teammate, at-large incumbent Marc Elrich? (The two finished first and second in that precinct and smoked everyone else.) One note: the term Democratic Crescent refers to Cabin Branch, Bethesda, Chevy Chase, Kensington, Downtown Silver Spring and Takoma Park, areas which tend to exert disproportionate impact on Democratic primaries. Over and over, we have seen that the average Democratic primary voter casts three votes for Council At-Large candidates. That statistic has been stable over time and does not vary much by voting mode (early, election day, absentee or provisional), geography, presence of open seats or candidate count. We see no reason why it would be significantly different in this election. What does that mean? 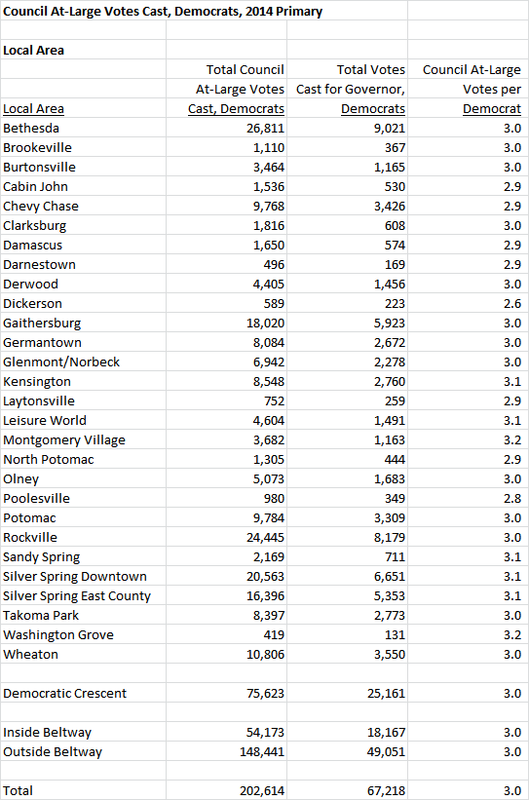 One obvious implication relates to one of the hottest places to find votes in a MoCo primary: the Downcounty areas of Downtown Silver Spring, Takoma Park and nearby locations to the north and northeast. Hans Riemer, Evan Glass, Will Jawando, Danielle Meitiv, Chris Wilhelm, Brandy Brooks, Seth Grimes, Cherri Branson, Jill Ortman-Fouse and Jarrett Smith are among the candidates who are from there and/or are running hard there. If each voter is only voting for three at-large candidates, there simply are not enough votes to go around for all of the above candidates. Who emerges from that scrum? Riemer ought to finish first in that area. He is not just the only incumbent in the race; he also finished second in Downtown Silver Spring, Takoma Park and Kensington to Marc Elrich in 2014, his best places of finish anywhere in the county. The next tier might be Glass, Jawando, Ortman-Fouse and Grimes, all of whom have done well in prior races in that area. How many votes are available there for anyone else? One of the greatest challenges of running for Council At-Large is how to allocate scarce resources across a vast county-wide electorate in the face of lots of competition and other draws on voters’ attention. Those candidates who successfully target the voters who align with their values, message, bio and (in some instances) demographic will have a leg up on their less strategic rivals. With only three at-large votes per voter, the premium on strategic engagement is higher than ever. It might just be decisive in an exciting and historic race. Previous PostGlendening Endorses MilanoNext PostClash on the Issues, Part II: is Ballooning Debt a Problem?